This makes a Perfect Sunday Merienda. As a working mom, I am always on the lookout for easy to prepare recipes. I feel happier if I come across easy to prepare and delicious recipes. We have a helper at home who is tasked to cook for our little family of 3. But most days, I really prefer to cook our meals by myself. Cooking is a great therapy for me, a respite from all the typing and reading and all-that-boring-stuff-office-people-do kind of thing. I am a pasta fanatic. Although I have been desperately trying to cut down on carbs recently, I would often choose a pasta meal on my cheat days. A pasta recipe is always easy to whip out. Actually, it was after learning to cook pasta al-dente that I fell in love with cooking. The rest is history, as the cliche goes. In my side of the family, we've always preferred to prepare homemade tomato sauce for tomato-based dishes. Through the years, we've finally learned how to make the perfectly easy yet tasty homemade tomato sauce. 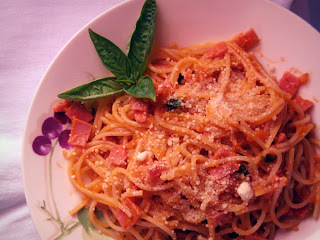 So if you like tomato-based pasta, let me share with you my version which was a recent hit with my co-workers. Their admiration of my home cooking inspired me (and gave me the confidence as well) to share the recipe in this blog. Wash the ripe tomatoes properly. Blanch the tomatoes, drain and put in ice bath or run through cold water. Peel the skin off. Chop the tomatoes. Make sure to save the juice as well. You can take out the seeds if you want (but I leave them since seeding takes so much time). Add about a teaspoon of salt and a dash of pepper. Mix then leave overnight in the fridge. Saute chopped red onion in olive oil until translucent . Add minced garlic. Do not brown the garlic to retain taste. 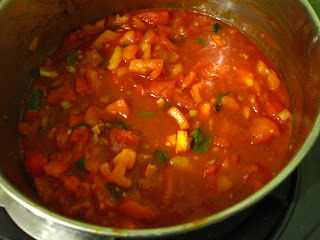 Add the chopped tomatoes (including the juice), stir and simmer for 5-10 mins. (I personally like to have tomatoes chunks on my sauce so I just simmer for 5mins). Add a cup of fresh basil or a teaspoon if you’re using dried. Transfer to blender or food processor and puree. Sauce is good for 1 kilo of cooked pasta (best to use is angel hair/spaghetti pasta). Top with sauteed mushroom-ham and Parmesan cheese. This recipe can feed 10 hungry adult stomachs. Sauté onion and garlic till translucent over olive oil and butter. Add chopped mushroom and cold cuts/bacon bits. Top over tossed tomato sauce and spaghetti. It's super easy and you can store the topping and the sauce separately. You can also opt to store the sauce on a sterilized jar for future use. You can probably store it for a week in the fridge or you can opt to freeze it for longer shelf-life and just thaw it in the microwave if you already intend to use it.